Apples, and Peaches, and Donuts, Oh My! Follow Carter Mountain Orchard as we keep you updated! follow the fun and know what's going on at your favorite orchard! How can it be the end of March already? Spring is such a busy time in the orchard! The warm temperatures have come on so quickly that everything is happening at one time! Peach trees are getting ready to bloom, apple trees won't be far behind, and we are cleaning the Country Store getting ready for our spring opening! Opening Day at Carter Mountain will be on April 16th! We'll be open on Fridays, Saturdays, and Sundays from 10-5, til the middle of June. We'll then start our 7 day/week schedule. While there is no Pick Your Own fruit available in the spring, you'll be able to visit our Wine Shop, get some donuts from the bakery, check out the new merchandise in our Country Store, and enjoy the view. On April 17th and 18th, we'll hold our first annual Spring Fling Festival! We've got crafters, food, music, wine, and hayrides lined up for your outdoor pleasure. Come on out for some outdoor fun - we are all so ready for it after the winter we've just come through! Visit our website for more information. And, become our fan on Facebook! See you soon! We get lots of questions this time of year about how the winter weather affects our crops. We appreciate our customer's concerns! This winter, we've had more precipitation than the past several winters, both in the form of snow (about 32 inches so far this year) and rain (we had flooding here just last week!). This is good, as the ground water is being replenished, and we'll appreciate that especially this summer, when things heat up! The cold temperatures are good right now as well. Both apple and peach trees require a certain number of "chill hours" each winter, in order to produce fruit. Some winters, when it's especially warm, it's a struggle to meet the requirements (this sounds like WE can control this, and we can't!). Dormancy is a part of the life cycle of the trees, and is very important. So, while this weather may not delight everyone, it's certainly been a good thing for the orchards so far. Now, when spring comes, the story will change! And we'll be sure to let you know. In the meantime, stay warm, dry, safe, and enjoy the beauty of winter. Spring will be here before you know it! Happy New Year! My resolution is to do a better job keeping up with our blog! Wishing you and yours a healthy and peaceful new year, and look for more blog posts very soon! Things are picking up on the mountain! Our first peaches are now available for picking! These are yellow clingstone peaches, very sweet and delicious! 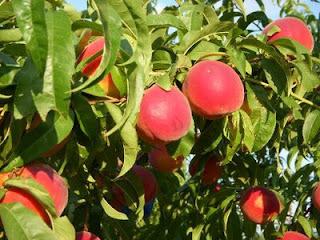 We also have fresh picked nectarines, white peaches, and summer Lodi apples! Yippee, summer is here! Eula has been making peach donuts, and baking pies - choose from peach, cherry, or apple. Our ice cream sales are brisk - it's a delicious treat on a hot afternoon. And cider slushies! Peach, or Muscadine (grape). Head on up soon! Now open daily - Monday through Saturday from 9-6, Sundays 10-5. Though we've only been open a few weekends so far this year, we've already made lots of new friends (customers)! These ladies live in Ohio, and have already visited us on 2 weekends this spring (and twice each of those two weekends!). They've shopped, tasted and bought wine, and even take our famous pies home with them each time they visit! (It's a 7 hour trip). These are some loyal friends! Come join in the fun at Carter Mountain - currently open Fridays, Saturdays, and Sundays from 10-5. Beginning June 12th, our summer hours begin (hours daily 9-6). See you soon! Hope you had a chance to visit us this Memorial Day weekend! The weather has been great, the Country Store is stocked, and the wine is flowing in the Carter Mountain Wine Shop! Christian and Pam are happy to pour you a taste! We're open Fridays, Saturdays, and Sundays (and today, Memorial Day) from 10-5. Beginning June 12th, we'll be open 7 days a week from 9-6. Check out the photos to see what's happening this weekend! Our Country Store is stocked with Gourmet Foods, Local Crafts, Jams and Jellies, and More! Weekends are Delightful at Carter Mountain! The view is great at Carter Mountain this time of year! After this week's rain, everything is gorgeous, green, and fresh! Our bakery is making some killer berry donuts (real fruit right in the batter), delicious pies, and cookies. The wine shop is open, and we've got lots of good stuff in the Country Store! Enjoy Mothers Day this weekend - bring Mom to the mountain! Pick Your Own Peaches and Apples at our beautiful mountaintop orchard. Located right next to Monticello and Michie Tavern, Carter Mountain is a favorite for locals and a destination for visitors! Browse our Country Store, try an apple cider donut from our Bakery, sample our wine in our Wine Shop and Tasting Room, and be amazed by our 360 degree view, featuring Charlottesville and the Blue Ridge Mountains.